What Did You Think Of NBC's London Olympics Coverage? | Run S.M.A.R.T. What Did You Think Of NBC’s London Olympics Coverage? Kind of old news but we just read the London Games had more viewers (219 million) than any other event in U.S. TV history yet so many seemed unsatisfied with NBC’s coverage. Obviously, we’re biased so not showing some major track events live was a real bummer, especially the men’s and women’s 100m, 200m and 1500m. Heck, they didn’t even show the steeplechase final during primetime coverage. You either had to stay up until 2am est or tape it and watch it the next day. The biggest criticism seems to be that NBC should have shown more live-coverage, yet NBC Sports Chairman, Mark Lazarus, thinks they should have shown more tape-delayed coverage! A director at Ad Age went further saying, ‘knowing the results of an event made you want to watch the coverage even more.’ But doesn’t that kind of ruin the whole experience? 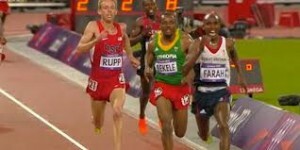 The suspense and excitement watching the men’s 10,000 meters was incredible.